Although an earthquake on 31 October preceded the race organisers went ahead with the event. The race distance was reduced from a marathon to a half marathon to meet concerns about runners' safety. In his marathon debut Hillary Yego won the Athens Classic Marathon over the original Marathon course from Marathon to the Panathenaikon Stadium, built for the first modern Olympics in 1896 writes Pat Butcher. For the women Joan Rotich led from the start to finish 100m ahead of Svitlana Stanko with Greek National Champion Magda Gazea in third. A record entry of 11,000 took part in the 31st edition, with a total more than 30,000 participants entered in all events. For the first few kilometres both men and women were on course for much faster times but from 12km, as both temperatures and topography rose, the pace of the men's lead group of 10 (including pacemakers) slowed to reach halfway in 1:06:48. Shortly afterwards defending champion Raymond Bett dropped out because of stomach problems. With the hills getting tougher until the highest point at 31km, more dropped behind, or dropped out. On the descent into Athens only a trio remained. David Rutoh was dropped with 5km to go, then Yego made the decisive move just before the 40km to ease ahead of Dickson Cheruiyot. In contrast to the men's race Joan Rotich led from the start and built up a big lead, passing 15k nearly two and a half minutes ahead of Ukraine's Svitlana Stanko. Rotich slowed on the hills and Stanko gradually cut back into her lead, but she still remained 25 seconds adrift as Rotich crossed the finish line. 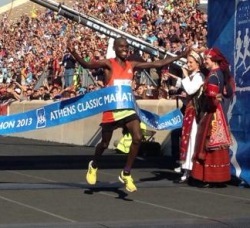 "The Athens Marathon is a special race, so I am very happy to have won it. It was a great feeling to run into the Olympic Stadium" she said. William Kipsang won his first Marathon since Rotterdam 2008, and posted his fastest time since then, to end a six-year Ethiopian winning streak in Beirut writes Phil Minshull. He broke away from the leading group shortly after halfway and went through 30km in 1:33:56 with a 19-second lead over the five-man chasing group. By 35km his lead had grown to 39 seconds with Kenya's Benjamin Serem and Sammy Malakwen, along with Ethiopia's Gemechu Lemma still together around 250m behind Serem then started to chase but could not quite reel him in. Race favourite Kedir Fekadu, who won last year in 2:12:57, was part of the chasing group at 30km but soon afterwards the Ethiopian started to struggle and he finished a disappointing seventh. Temperatures reached an unseasonably warm 23°C and the course records were never threatened. Over 36,000 participated in the event which included various youth and fun runs. Encouraged by Paula Radcliffe, women's world marathon record holder and race patron, 12,814 runners were attracted to the 6th edition. Of these, 8652 set off from the marathon start on the Promenade des Anglais to pass through seven coastal cities under sunny Mediterranean skies. 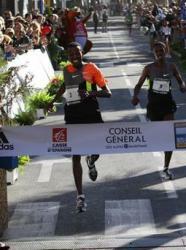 First to cross the finish line on the Boulevard de la Croisette in Cannes were Ethiopia's Abdisa Sori among the men and Salina Jebet for the women. For Sori the battle lasted the entire 42195m as countryman Edeo Telo finished within the same second, A strongly gusting wind slowed runners in the second half. Jebet, the race favourite, won by a minute. Wilson Kipketer, patron of the official charity Peace and Sport and triple 800m World Champion finished his second marathon in 3:15:08. "The route is fantastic. I'll be back next year" he said. Joining Kipketer was Vénuste Niyongabo from Burundi, who became the only Burundi national to win an Olympic medal by taking the 5000m title at the 1996 Olympic Games. These outstanding athletes joined forces as a team to run the Relay Marathon for Peace and Sport. The 6-person relay format is divided into sections of varying distances between 3km and 11km. 400 teams were on the start-line made up of friends, co-workers and families. New in 2013, the 2×21.1km race offers each runner the chance to run a Half-Marathon between Nice and Cannes. It was a huge success and attracted 881 two-member teams. In all 62 nationalities were represented with foreign runners making up 31% of the field. Over 4000 runners from 33 countries converged on this ancient Byzantine city to take part in races over different distances from a 2km Family Run to a full Marathon spread over two days. The perfectly flat course passes by a living backdrop of art, history and culture, giving runners the chance to enjoy seven of the eight Unesco monuments in Ravenna. All marathon finishers received a special handmade mosaic medal, representing part of the apse of the Galla Placidia Mausoleum. The AmeriKenyan Running Club dominated the top spots. Both winners times were the second fastest ever run in this race, now in its 11th year. Nine men finished under 1:05 this year after a total of only 13 runners breaking 1:05 in the past six years combined. Prize money of $17,850, the largest half marathon purse in the western US, was distributed between the top eight runners and top three masters. 7,200 finishers enjoyed in perfect race conditions along the rolling course that mostly tours the scenic and historic coastlines of Monterey and Pacific Grove. 14 runners passed one mile (1.6km) in 4:53, but a mile later there were five and by four miles Nelson Uyogi and Jacob Chemtai were away. They dueled all the way with Chemtai sprinting away on the gentle downhill finish. Sarah Kiptoo determined the women's race early on by going out with the lead men and building a substantial lead by two miles (10:10). In just her second ever race over the classic distance, Kenya's Rebecca Chesire held off a late charge from marathon debutante Elvan Abeylegesse writes John Mulkeen. Abraham Kiprotich opened up a gap of almost a minute over the rest of the field in the closing stages of the men's race. Turkish record-holder Sultan Haydar led the lead group in the women's race while marathon debutant Elvan Abeylegesse languished in 10th place, 40 seconds behind at 10km. Haydar reached halfway in 1:12:50 with six African runners still a stride or two behind. Abeylegesse lagged by a minute. Haydar still led at 30km with with just Rebecca Chesire and Amane Gobena left for company, while Abeylegesse had steadily made her way through the field into sixth place. She made up 30 seconds over the next 5kmand moved into fourth. The race really came alive in the closing kilometres as Haydar finally surrendered her lead to Chesire, while Abeylegesse looked poised to challenge on the shoulder of the Kenyan with 1600m to go. 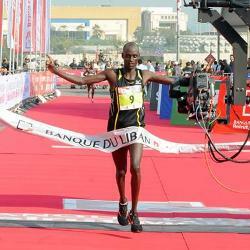 But Chesire had saved enough for the finish to win, 73 seconds slower than her marathon debut earlier this year. Abeylegesse achieved her sub-2:30 goal while Haydar ran one second faster than when she finished in the same position last year. Marathon debutant Desta Alemu took a group through halfway in the men's race in 1:04:23, with Abraham Kiprotich on his shoulder. The group slowed considerably in the next 14km until Kiprotich moved ahead decisively at 35km. Deriba Merga tried to follow him as Siraj Gena came through strongly into third position and went on to overtake Merga. 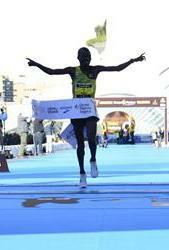 Felix Kipkemoi Keny fulfilled his prediction when he won the race in the fastest time yet run in Spain writes Phil Minshull. He took 17 seconds off his personal best and 16 seconds off the Spanish all-comers record dating from Jackson Kipkoech's win in Barcelona three years ago. Keny also sliced 45 seconds from the course record, set in 2011. A pack of about 20 runners, led by Qatari pacemaker Nicholas Kemboi, went through halfway in 1:03:44. 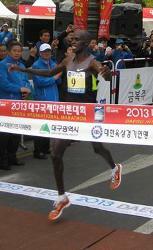 Jacob Kendagor then took the pace to 30km and shortly afterwards Keny broke away for the biggest win of his career. Ethiopia's Azalech Masrecha won the women's race comfortably, taking more than a minute off the previous course record set in 2002. A total of 9778 runners finished. Albina Mayorova came from behind to take the lead at 28km and went on to win in the fifth fastest time run at Yokohama. A small lead trio formed as early as 3km and by 7km it was down to Mizuho Nasukawa and Hiroko Shoi, running just behind the pace makers. Behind them, Asusa Nojiri, a former cross country skier, soon bridged the gap to join them but by 11km Shoi started to drift back. At that point, Jessica Augusto and Albina Mayorova were running fourth and fifth, and Augusto started to chase. When pacemakers dropped out at 20km Nojiri led, with Nasukawa just behind her. Shoi was alone in third but Augusto was closing. Mayorova started to push the pace really hard from halfway (reached in 1:13:02) and moved up to third by 22km, as Nojiri drew slowly ahead of Nasukawa. Mayorova passed Nasukawa at 26km and into the lead at 28km.